In 1-cup measuring cup, mix olive oil, thyme, rosemary, nutmeg and garlic. Cut potatoes in half; spread on nonstick 15x10x1-inch pan. Drizzle with olive oil mixture; toss to coat. 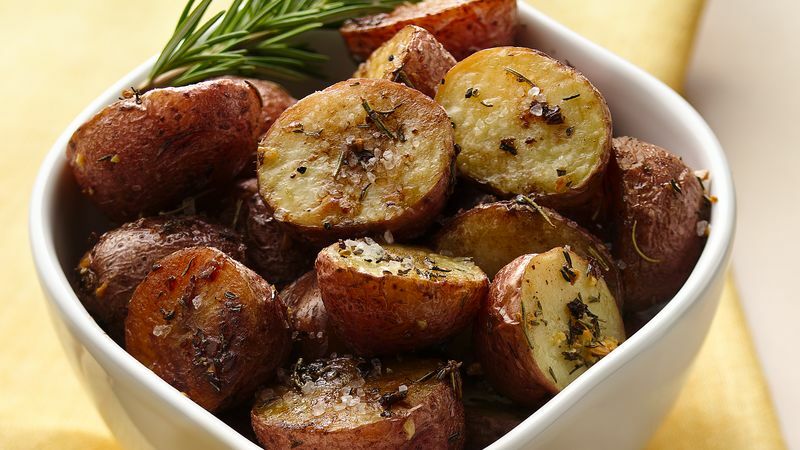 Bake 30 to 35 minutes or until potatoes are golden and slightly crispy. Drizzle with balsamic vinegar; toss to coat. Bake 5 minutes longer. Sprinkle with salt and pepper. A nonstick pan works best to prevent sticking. If using a regular pan, stir potatoes halfway through baking to help prevent sticking. True balsamic vinegar comes from Modena in Northern Italy. Balsamic vinegar is made from sweet white grapes. The vinegar is aged. During that process, moisture evaporates, further thickening the vinegar and concentrating the flavor.